Oh my I'm a little behind, I've missed a couple of weeks, but I'm back now. I have actually had a few FO's to share too, just not the computer time to do so. 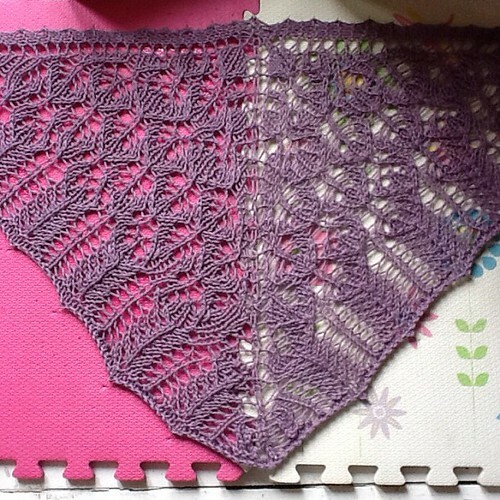 Anyway here is a new one, literally just finished this morning and still blocking as I type, it is my first ever shawl and my first completed lace knit item too. OK so there are quite a few mistakes in the pattern, but I don't think you'll notice when I'm wearing it, it's also quite a lot smaller than it should be. I'm putting this down in part to the yarn, in part to the needles, and well, of course, I didn't swatch so really I deserve no sympathy. I'm blocking it pretty hard and hoping for the best, as long as it fits around my neck I'm happy! I had, had a couple of unsuccessfully creative days, everything was going wrong and nothing was turing out as I had hoped, as I result I really needed something satisfyingly quick to knit but a little challenging. This pattern couldn't be more perfect for this, I cast it on last night, and as you can see it did not take long to complete! And there was a lot of unknitting involved too! I had the yarn held up in an unfinished baby blanket that I frogged for this purpose and I really didn't use very much either, less than 4 50g balls. It's rowan's cashsoft chunky, which I purchased from a closing down yarn shop a few years ago. 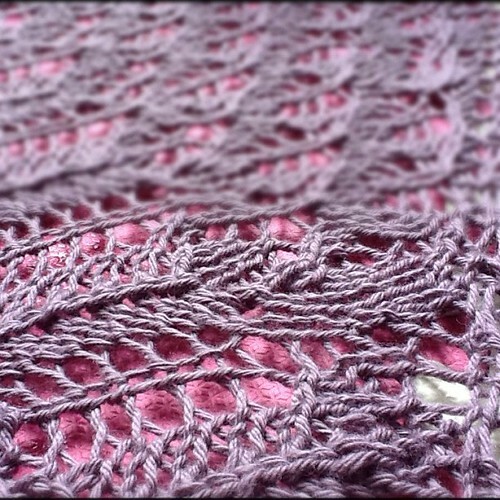 It's lovely, and I still have quite a lot left, if it didn't seem ridiculous to own 2 shawls in exactly the same colour and yarn and pattern I would knit up another! Maybe I'll need to make one as a gift. For more FO Fridays check out Tami Amis' blog.